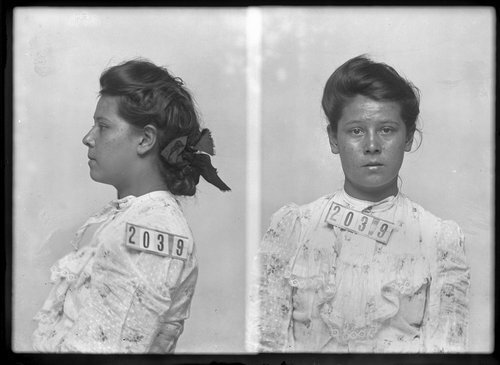 A photograph of Lizzie Cardish, a United States civilian prisoner at Fort Leavenworth and housed at the Kansas State Penitentiary in Lansing, Kansas. Cardish, a Native American, was found guilty of arson on a government reservation in Wisconsin and sentenced to life in prison. At the time she was sentenced, Cardish was age 15. Her sentence was commuted six years later at age 21.